The first of the jewelry shows opened in Las Vegas on Tuesday with JCK Luxury 2013. 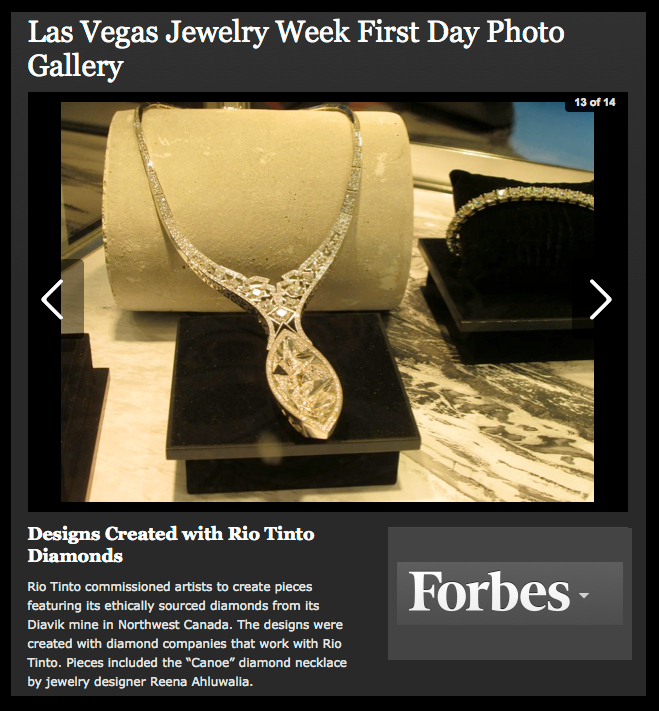 Reena Ahluwalia's Canoe Canadian Diamond Necklace was a highlight at the Rio Tinto Diamonds booth, LUX 105, as featured in FORBES. Thank you, Anthony DeMarco, FORBES. Inspiration for 'Canoe' necklace came from the poetic image of a magical Canadian landscape and its pristine white winters. Snow covered Canoe in a frozen, crystalline lake. The necklace comes together with two diamond-studded links embracing the neck that represent the fluidity of a lake. Irregular intersecting lines, studded with ideal square-cut diamonds characterizes chunks of floating ice. The necklace culminates into a canoe-shaped element with an angled faceted interior.